Vancouver, the most populated city in British Columbia, is a Canadian leader in building and designing “all ages and abilities” cycling infrastructure. In 2017, Vancouver adopted a Complete Streets policy framework including a traffic by-law giving the City Engineer delegated authority to make street modifications to support safety and mode share targets to deliver Complete Streets. The city has seen a major modal shift towards cycling, walking and transit in recent years thanks to strong policies, integration with existing guidelines, and funded implementation plans. In April 2017, City of Vancouver staff submitted a recommendation to Council that the City adopt a dedicated Complete Streets Policy Framework, bringing together existing city-approved transportation policies while supporting broader city goals. At the same time, the City Engineer’s delegated authority was modernized to allow minor streetscape alterations in accordance with Complete Streets design principles without the requirement of council approval (a similar capacity to make street changes on behalf of motor vehicles has existed since 1944). Council approved these amendments to the Street and Traffic By-law in May 2017. The City of Vancouver’s 2012 “Transportation 2040 Plan” does not use the term Complete Streets explicitly but it refers to the same principles. The Plan establishes a modal hierarchy that places walking, followed by cycling and transit, at the top of the scale (p. 16). It also commits to building streets that accommodate all users using a context-sensitive design approach. Vancouver’s “Greenest City 2020 Action Plan” is a strategy for ensuring Vancouver stays on the leading edge of urban sustainability practices. The strategy prioritizes using “land-use and zoning policies to develop complete compact communities and complete streets that encourage active transportation and transit” (p. 25). Vancouver’s 2015 “Renewable City Strategy: 2015-2050” advocates for the acceleration of Complete Streets in the city, while also proposing to “use land-use and zoning policies to develop complete compact communities and Complete Streets that encourage active transportation and transit” (p. 42). Complete Streets redesigns are underway on Georgia Street, Commercial Drive and in the Gastown neighbourhood, which are all major destinations for visitors and residents. Commercial Drive is included in the 2016 “Grandview-Woodland Community Plan“, which adopts a Complete Streets approach for the area (p. 139-140). In March 2017, the City of Vancouver released “Transportation Design Guidelines: All Ages and Abilities Cycling Routes“. For well over a decade, Vancouver’s Burrard Street Bridge was a hotly contested piece of asphalt. In 1996, what was supposed to be a six-month trial that converted one lane of traffic into a bicycle lane only lasted a week, due to public outcry. From 2005 to 2009, proposals to again trial bike lanes or expand the sidewalk were stymied by rising costs and concerns from motorists, heritage preservationists and the Squamish First Nations group, whose land falls under the bridge. With the Olympics coming in 2010, the City finally agreed to a trial that reduced the number of vehicle lanes on the west side (heading out of downtown) to two and added a separated bike lane. Three vehicle lanes were maintained heading into downtown, and the sidewalk on that side was reserved for eastbound cyclists. Pedestrians were restricted to the sidewalk on the west side. 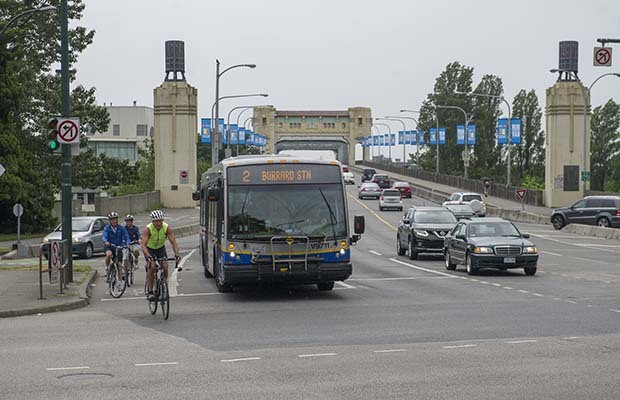 The trial was extremely successful in increasing bicycle traffic, with the City of Vancouver reporting 24% more bicycle trips over the bridge between July 13, 2009 and July 12, 2010. This amounted to an additional 200, 000 bike trips in one year. Growth on summer and fall weekends was the most dramatic, with volumes up 40-70%. 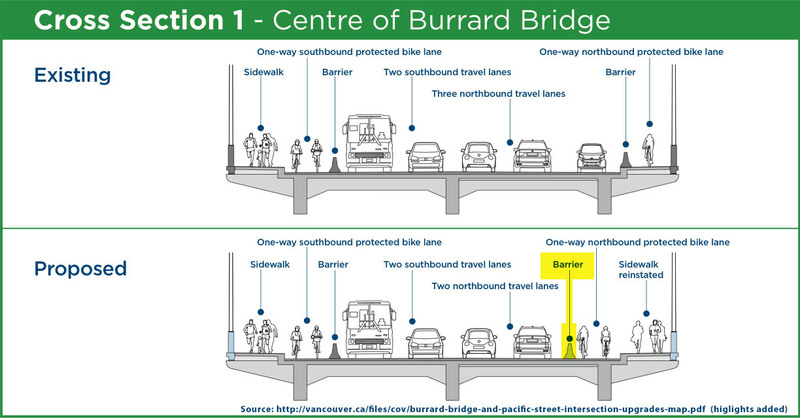 A study by the University of British Columbia indicated that accident rates for cyclists on the Burrard Street Bridge decreased, and the process was also the focus of a research paper at the University of Toronto, titled, “”The politics of bicycle lane implementation: The case of Vancouver’s Burrard Street Bridge. Vancouver City Council voted to make the bike lane permanent in July 2010. Although the trial bike lane was successful in improving safety and access for cyclists, it also limited pedestrian use to the west side of the bridge. Because of its limited capacity, a redesign was needed to enhance access for all ages, abilities and modes of travel. In 2015, the required replacement of water and sewer infrastructure provided the redesign opportunity to make the bridge a Complete Street. 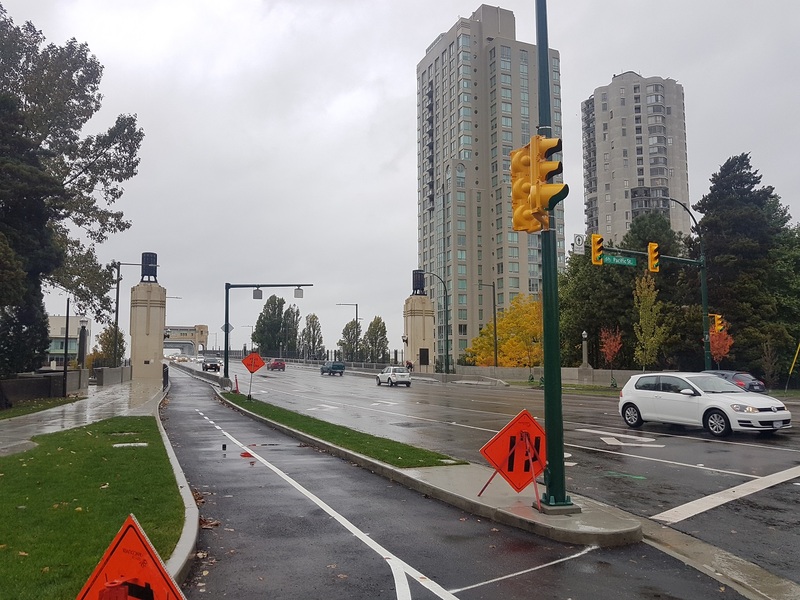 Due to policies adopted by Council, city staff produced a redesign using a Complete Streets approach for this significant piece of infrastructure and for its northern intersection at Pacific and Burrard. At a cost of $35 million, the redesign shows a major improvement in function of the bridge and intersection. Specifically, the changes have improved safety and comfort for all users, maintained previous traffic flow and car volumes on the bridge during peak hours, and preserved the historic and aesthetic value of the bridge. The most significant changes were subject to heavy discussion and debate at Council and among civic groups alike. This was due to the removal of a southbound traffic lane on the bridge, to provide two-way separated bike lanes and sidewalks on both sides of the bridge. According to Vancouver planning staff, the redesign will not significantly affect traffic times or congestion, and has maintained previous traffic conditions leading northbound into downtown Vancouver. After 18 months of construction, this iconic Vancouver bridge was reopened with a Complete Street redesign on October 21, 2017.